Description: A coarse powder, dark red in color, with aroma and mild flavor typical of ancho chile powder. Usage: Add directly to recipes when a boost of flavor and heat are desired. 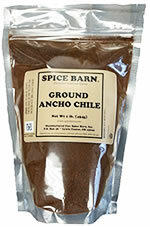 Substitute 1 tablespoon of ancho powder when a recipe calls for 1 whole ancho chile.